Jainism was established by a lineage of 24 enlightened beings or Tirthankaras, culminating in Parsavnath and Mahavira. Gujarat is an important religious centre for the people of Jain community as it is the place where 22nd Tirthankara attained salvation. Girnar and Satrunjaya are serene places in Gujarat boasting the footsteps of Jainism. These are the places where monks come to seek salvation and blessings of Lord Mahavir. The major number of Gujarat Jain temples was built between 6th and 7th century CE and were patronised by the Solankis and Chavadas. By, 13th century, the North region of Gujarat was a major Jainism centre. The state has still in its holds the precious teachings of Jainism in its opulent Jain Temples located in different areas. Jain pilgrimage centres in Gujarat include places like Palitana, Girnar, Kothara, Naliya, Taranga and Songadh. 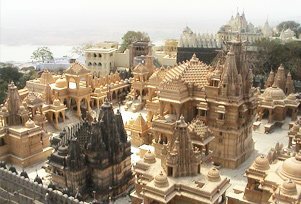 Most exquisite Jain temple in Gujarat is the Palitana Jain Temple. With over 3,800 stone steps, the climb is not easy, but that does not deter thousands of devotees from going there every year. Breathtaking Palitana temple is built over a period of 900 years from the 11th century onwards. Holiest temple within the cluster of Palitana temples is that of Adinath, the first amongst the Jain Tirthankaras. 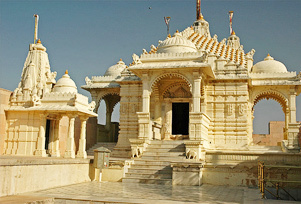 A cluster of five marble shrines at Kumbhariya Jain temple is also a Jain temple worth visiting on a tour to Gujarat. Richly endowed pillars of the Palitana temple looks like Dilwara and Ranakpur temples of Rajasthan. Gujarat is indeed a major place to explore the culture, rituals and traditions of Jains. The state is an important stopover point for people who are going for a Jain Temple Tour in India. There are many Jain temples in Gujarat and witnessing them is an utterly heart-warming experience. Have a look at some of the prominent Jain temples of Gujarat which are an important part of culture and history of the state.